Fits Honda CT70 Years 1969 to 1994. These are nice rear shocks designed to match the look of Honda OEM shocks but they have a much heavier spring than the OEM springs. These shocks are for adult riding, they are 10mm taller than OEM to help prevent bottoming out. 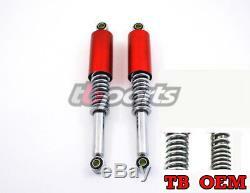 The item "Honda CT70 Rear Shock Set Candy Red 1969 through 1994 Heavy Duty Springs" is in sale since Sunday, January 7, 2018. This item is in the category "eBay Motors\Parts & Accessories\Motorcycle Parts\Other Motorcycle Parts". The seller is "hondaproducts" and is located in Beaverton, Oregon. This item can be shipped to United States, Canada, Denmark, Romania, Slovakia, Bulgaria, Czech republic, Finland, Hungary, Latvia, Lithuania, Malta, Estonia, Australia, Greece, Portugal, Cyprus, Slovenia, Japan, Sweden, South Korea, Indonesia, Taiwan, South africa, Thailand, Belgium, France, Hong Kong, Ireland, Netherlands, Poland, Spain, Italy, Germany, Austria, Mexico, New Zealand, Philippines, Singapore, Switzerland, Norway, Saudi arabia, United arab emirates, Qatar, Kuwait, Croatia, Malaysia, Brazil, Colombia.